* You will love our Block Wagon. * It's perfect in children's playrooms and great for storing our Hard Maple Unit Blocks or all those little toys that just keep floating around. 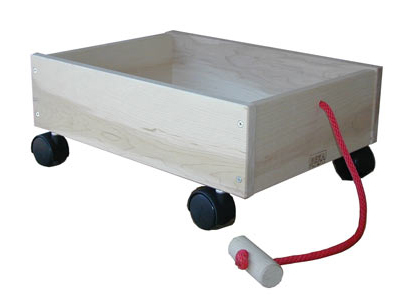 * Beautifully made, our cart has Solid Hard Maple sides and ends, a sturdy 1/8" thick tempered hardboard bottom and four heavy duty swivel casters. * The easily gripped pull cord is great for moving even heavy loads from place to place. * Dimensions are 13"W x 24"L x 5"H (7-1/2" including casters). Adult Assembly Required.